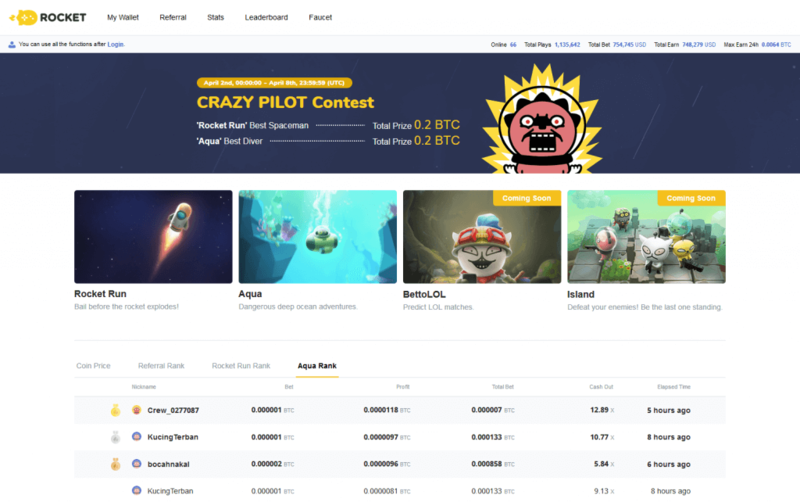 Rocket is a Cryptocurrency online gaming platform, operating under Curacao regulations. They aim to provide a user-friendly playground with very low commissions, fast and safe withdraw procedures and a fast and effective support team. As is well known already, any online casino that uses cryptocurrencies gains the credibility needed to prove its security and provably fair gaming. This is because the technology behind the cryptocurrency is encrypted and leaves no room for any human interference or manipulation. Rocket provides some very unique fairly proven games such as the Rocket Run, Aqua, Island and Bettolol. Another feature that makes this crypto casino stand out is the chat channel they provide, where you can share information concerning cryptos and even compete with your friends or other players. And not only that, but through their referral program you can also invite and bring friends thus earning bonuses, or you can also create customised affiliate campaigns and get extra benefits. Rocket Casino also offers you a wallet that has an established security level, trustworthy compliance, fast service, and the best exchange rates available for all players. They support a multitude of cryptocurrencies such as Litecoin, Ethereum, Ripple, Dash, Stellar and BitCoin. This of course makes it easier to go through your transactions since you have many options for deposit and withdraw. For any kind of enquiry, you can contact the support department at [email protected] who are always eager to provide a fast and helpful service. If you’re looking for a crypto casino with great support as well as an online community to chat with then this casino could be the one for you! If you’d like to read some more reviews you can find more crypto casino reviews here.